Cue the holiday music! We are officially less than a month away from a new year, though it seems as if I was writing my 2015 resolutions yesterday. For many of us, this time of year means a great deal of rushing to finish work and unending shopping trips despite the holiday cheer. 1. Catch up with a friend. Reminisce on old memories & make new ones. For anything. This shouldn't start/end with Thanksgiving. 3. Pick up a new book. I'll admit I'm not the best with this, but upcoming travel plans will make that change! 4. Make that Black Friday return before it's too late. I unknowingly bought two almost identical tops. Guilty. 5. Get a head start on holiday gift shopping. Comment below if you would like a holiday gift guide! 6. But save some money too. Start cooking more. Take the subway. You don't need another pair of black booties. Near or far. Take some time away from everyday life. Whether it's for an upcoming trip or school semester, don't wait until the last minute. 9. Indulge in a good meal. Because it's the holiday season, right? 10. Then work it off. The resolution that everyone states, but no one follows. Guilty again. 11. Acquire a new skill. Before a new year starts, take that class you've been meaning to attend since 2013. To a museum, or to lunch. I just recently learned the value of one's own company. 13. Create a holiday playlist. Michael Bublé's album is still at the top of mine. Even if it's not for the holidays. A little room upgrade can make all the difference in your day. 15. Don't wait to buy your New Year's dress. Or you'll be stuck scouring Forever 21 for the least tacky one on December 31. Chances are you stocked up this past weekend. Clear out your closet with holiday spirit! 17. Spend a day in bed. 18. But don't forget the hustle. That to-do list isn't getting any shorter. But it will pay off in the end. 2016 is less than a month away. New year, new beginnings! This is such a fun post to read! I hope you accomplish all of these :) Love your photos too, great post! 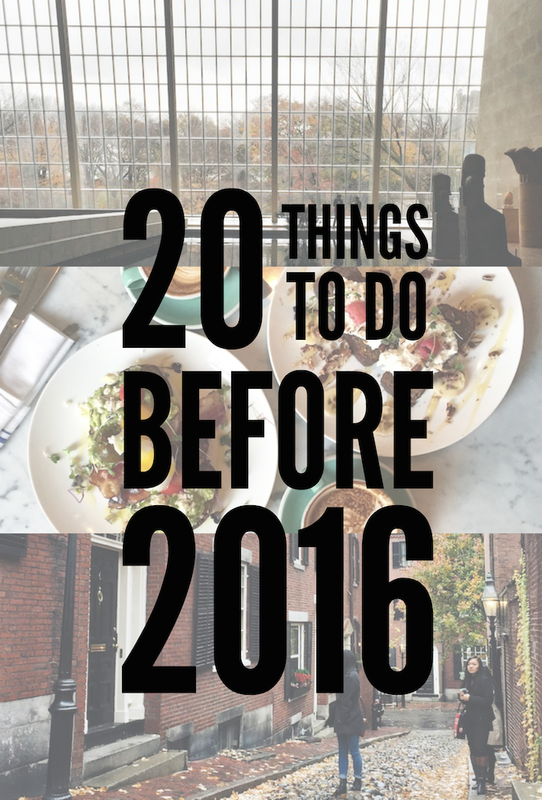 Great list, got me thinking of what I want to do before saying adios to 2015. Goodluck accomplishing some or all of the items on your list. I love this post. I'm going to take a page from your book and follow a few of these things myself! Great 2015 bucket list! Good luck to 2016! Loved reading this post! Great ideas! Loved this post! I absolutely love the ideas, definitely still wanna spend a whole day in bed! Great tips, I need to do one of these suggested tips! Loving this list! I'm definitely going to catch up with some reading! Such a nice post indeed! Great thoughts! Thanks for sharing! Have an amazing weekend! Agree with all of these. There is so much that can be done now before the new year. I can especially relate to number 4. What a fun list! I I'll definitely be participating in number 9 as much as possible before the year wraps up!